Assassin’s Creed Embers is an animated short movie created by UbiWorkshop. Assassin’s Creed Embers revealed by Ubisoft on June 6, 2011, UbiWorkShop released a teaser trailer on 21 July 2011, which was featured at Comic-Con 2011 and then it was released on November 15, 2011, alongside several special editions of Assassin’s Creed Revelations. The film will be included as a bonus in Signature and collector’s editions of Assassin’s Creed: Revelations. But, you’re also can watch Assassin’s Creed Embers full movie in here. The Assassin’s Creed Embers trailer shows an older Ezio with his family. He fears someone is trying to get him. 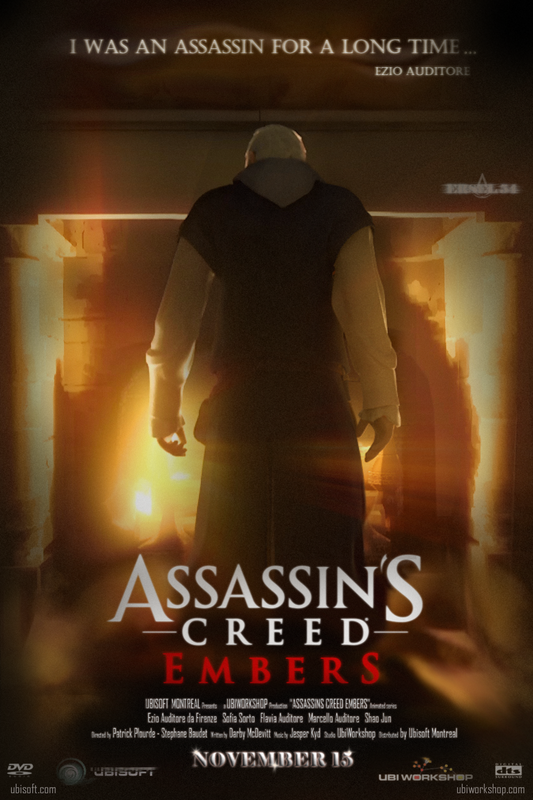 The developers described Embers at the 2011 Comic Con, at the Assassins Creed panel as a final epilogue to Ezio’s story, and although can be watched anytime, should be watched after the completion of AC:Revelations story, to fully understand and complete the tale of Ezio Auditore da Firenze. Assassin’s Creed Embers is available in 15 languages, either through voice dub or subtitles.